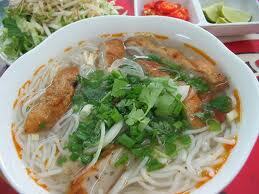 Bun Cha is very popular in Hanoi and one of my all-time most-wanted dishes. It doesn't sound fancy, just couple slices of grilled pork but when they're placed in the combination with noodle, the green, herbs and especially fish sauce broth, everything just becomes fantastic. I guess that's the way Hanoi people enjoy their food too: simple but exquisite. The amount of spices I use in this recipe is based on what I have in my kitchen, which may vary from different brands; therefore, you may need to adjust the spice amount like fish sauce, sugar...to suit your taste. 1 lb pork belly (or pork shoulder if you can't find or don't like pork belly. However the belly tastes the best). 1 lb fresh ground pork. 1 red Fresno chilly (or less if you can't handle hot spice). 1 piece of green papaya (about 2x3 inch), replaced by kohlrabi, radish if green papaya is not available. 1 cup and 3 tablespoon fish sauce. In a bowl, well mix ground pork with remaining shallot, green onion, 1/2 remaining garlic, 1 tablespoon fish sauce, 1/2 teaspoon ground pepper, 1/2 tablespoon sugar, 1 tablespoon oil and a little bit salt. Moisten your hand shape the mixture into small balls (as big as a medium sized lime). Press the balls to reduce thickness. Leave the meat marinate at room temperature for 1hour. The best is to marinade overnight in refrigerator then leave at room temperature 30 minutes before cooking. Prepare the vegetable and vermicelli: Boil vermicelli if you use dry one. Instruction should be visible on every package. Cool under cold tap water. Drain and set aside. No need to worry about this hassle If you use fresh vermicelli. Generously peel carrot, radish or kohlrabi. If you use green papaya, peel and discard the inside, soak in salt water then rinse thoroughly to remove resin. Thinly slice them crosswise. 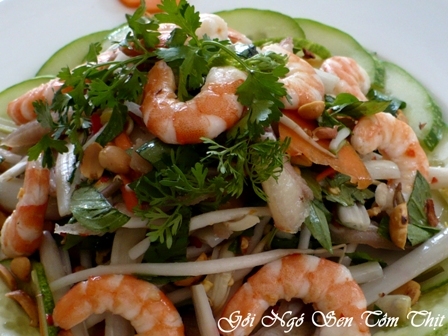 Place in a bowl, add in rice vinegar, 1 tablespoon fish sauce, 1/2 tablespoon sugar. Mix well and set aside. Prepare this mixture in advance to give it enough pickle flavors. Wash and coarsely chop green lettuce. Rinse thoroughly and shake dry all the herbs. Place the meat on grill grates and grill until it turns light brown and cooked through. Brush additional oil on the meat while grilling if it seems too dry (this may happen when using pork shoulder instead of belly). Do not bake the meat. Brush in anato oil for better look. Remembe good Bun cha doesn't depend much on the meat. In fact, it's the decision of the sauce. Rinse chilly, discard stem and chop coarsely. While waiting for the meat to rest, in a medium bowl, add: remaining garlic, 4 tablespoon sugar, 3 cup cool water and stir until sugar is totally melted. Add in 1 cup fish sauce, lime juice and chopped chilly. Add more or reduce fish sauce, sugar depending on your taste. Divide meat, vermicelli and vegetable into equal portions or serve them as buffet. For the sauce, divide into small bowls, then add the carrot mixture into every bowl. Dip vegetable, herbs and meat into the sauce. Pour some sauce over vermicelli or dip it in the sauce if you like the thick taste. Eat a piece of meat with a piece of lettuce, herb, carrot and vermicelli all together to experience the combination of tastes. Quán “Bún chả 54” địa chỉ tại 54 Đinh Tiên Hoàng, P. Đa Kao, Q1. Đặc sản có khoảng 70 món gồm các món bún chả Hà nội, nem cua bể, chả giò cua biển, các loại bún như bún ốc, bún thang, bún cá rô đồng, các loại miến xào như miến xào tim cật, miến xào hải sản, miến xào cua, gà tần thuốc Bắc, ốc dồn thịt hấp lá gừng, và cơm chiên các loại. 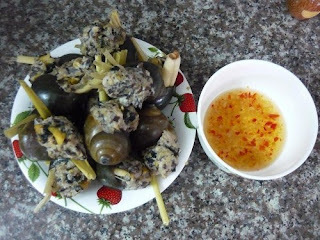 Quán còn có các món ăn truyền thống như xôi chiên hay bánh đa. Bên cạnh đó Quán còn có hải sản tươi từ Quy Nhơn đặc biệt có chả cá Quy Nhơn. Bún chả cá Quy Nhơn có hương vị đậm đà của vùng đất võ trời văn. Các món cơm phần với thực đơn đa dạng và hải sản tươi sống là điểm cuốn hút của quán. Thức uống có nước mơ, sấu, và bột sắn dây lấy từ Hà Nội và các loại nước ép, sinh tố. Bơ và chanh dây được lấy từ vườn nhà ở Đà Lạt. Bien has an engineering background and received an MBA in International Business and Telecommunications Management from Golden Gate University (San Francisco, Calif., US). Mr. Nguyen has extensive international experience, travelling, working, living in several locations in North America, Europe, and Asia. Vietnamese is his mother tongue and his English is advanced. He has a substantial network of professional contacts around the world. Bien is a frequent speaker at several international conferences. He is knowledgeable about fixed-line telephony, Internet services, cellular wireless networks and technologies, data center and contact center businesses, submarine cable network and infrastructure in Vietnam. Bien has dealt with R&D, product development, business development, strategy formulation, sales and marketing management, project management, M&A and buyouts in the ICT industry. Bien is an experienced commercial development loan consultant, management consultant, and business development expert.